[Bartlett & Sullivan]. Quincy, Illinois, Sat., June 8, 1839. [Vol. 2 – No. 6]. In your paper of the 18th inst. I see a letter signed by somebody, calling herself Matilda Davidson, pretending to give the origin of Mormonism, as she is pleased to call it, by relating a moonshine story about a certain Solomon Spalding, a creature with the knowledge of whose earthly existence, I am entirely indebted to this production; for surely, until Doctor Philastus Hurlbut informed me that such a being lived, at some former period, I had not the most distant knowledge of his existence; and all I now know about his character is, the opinion I form from what is attributed to his wife, in obtruding my name upon the public in the manner in which she is said to have done it, by trying to make the public believe, that I had knowledge of the ignorant, and according to her own testimony, the lying scribblings of her deceased husband; for if her testimony is to be credited, her pious husband, in his life time, wrote a bundle of lies, for the righteous purpose of getting money. How many lies he had told for the same purpose while he was preaching, she has not so kindly informed us; but we are at liberty to draw our own conclusions; for he that would write lies to get money, would also preach lies for the same object. This being the only information which I have, or ever had, of this said Rev. Solomon Spalding, I, of necessity have but a very light opinion of him as a gentleman, a scholar, or a man of piety; for had he been either, he certainly would have taught his pious wife not to lie, nor unite herself with adulterers, liars, and the basest of mankind. 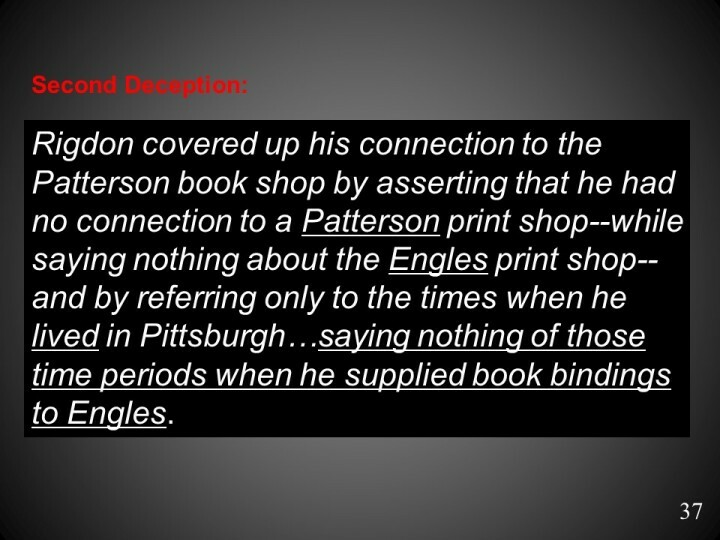 It is only necessary to say, in relation to the whole story about Spalding’s writings being in the hands of Mr. Patterson, who was in Pittsburg, and who is said to have kept a printing office, and my saying that I was concerned in said office, &c. &c. is the most base of lies, without even the shadow of truth; there was no man by the name of Patterson during my residence at Pittsburgh who had a printing office; what might have been before I lived there I know not. Mr. Robert Patterson, I was told, had owned a printing office before I lived in that city, but had been unfortunate in business, and failed before my residence there. This Mr. Patterson, who was a Presbyterian preacher, I had a very slight acquaintance with during my residence in Pittsburgh. He was then acting under an agency, in the book and stationery business, and was the owner of no property of any kind, printing office, or any thing else, during the time I resided in the city. If I were to say that I ever heard of the Rev. Solomon Spalding, and his hopeful wife, until Dr. P. Hurlbut wrote his lie about me, I should be a liar like unto themselves. Why was not the testimony of Mr. Patterson obtained to give force to this shameful tale of lies; the only reason is, that he was not a fit tool for them to work with; he would not lie for them; for if he were called on, he would testify to what I have here said. Let me here, gentlemen, give a history of this Dr. P. Hurlbut and his associates, who aided in getting up and propagating this batch of lies. This said Doctor was never a physician, at any time, nor anything else, but a base ruffian. He was the seventh son, and his parents called him Doctor; it was his name, and not the title of his profession. He once belonged to the Methodist Church and was excluded for immoralities. He afterwards imposed himself on the Church of “Latter Day Saints,” and was excluded for using obscene language to a young lady, a member of said church, who resented his insult with indignation, which became both her character and profession. After his exclusion, he swore — for he was vilely profane — that he would have revenge, and commenced his work. He soon found assistance, a pious old deacon of the Campbellite church, by the name of Onis [sic] Clapp, and his two sons, Thomas J. Clapp and Matthew S. Clapp, both Campbellite preachers, abetted and assisted by another Campbellite preacher by the name of Adamson Bentley. Hurlbut went to work, catering lies for the company. Before Hurlbut got through, his conduct became so scandalous, that the company utterly refused to let his name go out with the lies which he had collected, and he and his associates had made; and they substituted the name of E. D. Howe. The change, however, was not much better. There were scandalous immoralities about the Howe family of so black a character, that they had nothing to lose, and became good tools for this holy company to work with. A man of character would never have put his name to a work which Hurlbut was concerned in. But while Hurlbut was busily employed in the service of the company, old deacon Clapp was employed in taking care of his wife. How many others of the company aided in this business must be left to futurity to disclose. At a certain time, Hurlbut being out till a late hour in the night, returned to his house, and in going to his bed room where his wife was. Behold and Lo! there was the pious old deacon, either in the bed with his wife, or at the side of it. He had a five dollar bank note in his hand, and his dress was rather light, to suit the Doctor’s taste; for he was not quite as well off as was Aaron, when he offered sacrifice; not even having on a pair of “linen breeches.” Hurlbut laid hold of him and called for help, which soon came to his assistance. The pious old deacon was arraigned before a justice of the peace, and was on the eve of being bound over for his appearance to the county court, when to put an end to the evils which might result from his pious care of Mrs. Hurlbut, he kindly offered a yoke of oxen and a hundred dollars; this was accepted. Hurlbut took his wife and left the country forthwith, and the pious old deacon and his sons and the good Mr. Bentley, are left to wear out the shame of their great effort to destroy the character of innocent men, whom they never dare meet in argument. The tale in your paper is one hatched up by this gang before the time of their explosion. It has always been a matter of no ordinary satisfaction to me, to know that my enemies have no better weapon to use against me, or the cause in which I am engaged, than lies; for if they had any better, they would certainly use them. I must confess, however, that there is some constancy in our persecutors; for, as truth never can destroy truth, it would be in vain for our persecutors to use truth against us, for this would only build us up; this they seem to know, and lay hold of the only available means they have, which are lies. And this, indeed, is the only weapon which can be or ever has been used against the truth. As our persecutors are endeavoring to stop the progress of truth, I must confess that they act with a degree of consistency in the choice of the means, namely, lies — but if truth would do it, they would surely not have recourse to lies. In order to give character to their lies, they dress them up with a great deal of piety; for a pious lie, you know, has a good deal more influence with an ignorant people than a profane one. Hence, their lies come signed by the pious wife, of a pious deceased priest. However, his last act of piety seems to have been to write a bundle of lies, themselves being witnesses; but then his great piety sanctifies them, and lies become holy things in the hands of such excessive piety, particularly when they are graced with a few Reverends; but the days have gone by, when people are to be deceived by these false glossings of Rev’d sanctions; the intelligent part of the communities, of all parts of the country, know that Rev’ds are not more notorious for truth than their neighbors. The only reason why I am assailed by lies, is that my opposers dare not adventure on argument, knowing that if they do, they fall. They try, therefore to keep the public from investigating, by publishing and circulating falsehoods. This I consider a high encomium on both myself and the cause I defend.